In our commitment to help you find products that are suitable for your skin’s needs, we came up with this list of the best foundation for oily skin. This list is a result of more than 20 hours of hard work as we rank the products based on their compatibility with oily skin, oil control properties and value for price. If you are looking for a foundation that can last the whole day, Estee Lauder Double Wear Stay-in-Place is a great choice. It's especially formulated to withstand heat and humidity so you won't have to worry about your makeup wearing off by midday. 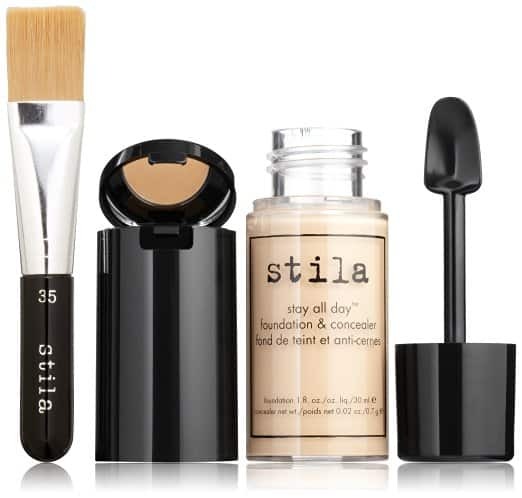 Stila Stay All Day Foundation offers a buildable coverage and a handful of skin benefits. It has a unique packaging and comes with a concealer hidden somewhere in its cap (hint: and a mirror, too!). CoverGirl Clean Oil Control Liquid Makeup has everything you need in a foundation for oily skin. It can control oil, is non comedogenic and dermatologist tested. It's coverage, however, is limited to light to medium. If you have dark blemishes you want to completely cover, this might not be the right fit for you. For oil control that won't make your skin dehydrated and dry, your best option is Make Up Forever HD Invisible Cover Foundation. It has a fluid-like consistency and a buildable coverage you can work with. Although it has oil-absorbers, it will still leave your skin looking healthy. With a clarifying and brightening effect, NARS Sheer Matte Foundation offers a natural matte finish. Don't be misguided by its name because although it says sheer, it actually has a buildable medium coverage. From creams to sticks, here are the 5 best foundations for oily skin that are sure to give you flawless results- minus the shine. Estee Lauder Double Wear Stay-in-Place is a long wearing product. It promises to stay on your skin for 15 long hours. For someone with oily skin, this sounds great news as the product is formulated to last through humidity as well as heat. It won’t smudge or wear off easily. It provides a full coverage and leaves a matte finish on the skin. Despite these features, the foundation is actually light and has a liquidy texture. You can use either a brush or a wet sponge to apply the product on your skin. Take note, however, that this one doesn’t come with a pump which can make dispensing a bit difficult. Instead, you get a glass bottle with a golden screw cap. Since it’s glass, the foundation got a luxurious feel to it- and a hefty price tag, too. It has a wide range of shades that can fit warm, neutral to cool undertones. If you are looking for a foundation that can give you a flawless, yet breathable, finish, you should definitely not miss Stila Stay All Day Foundation. Its formula glides smoothly on the skin, leaving it hydrated without the greasy feel. Aside from the good coverage it offers, it also has botanical extracts to boost the flow of blood and oxygen in your skin. As a result, you get healthy and glowing skin. This foundation comes with a foundation that cleverly sits inside the cap. Its packaging includes a glass bottle and a twist off cap that comes with a built-in spatula. There’s a handy mirror, too. I actually like this packaging since it’s more hygienic and lets you get just the right amount of product you need. I also liked how all the elements were brilliantly packed in such a unique way. In terms of oil control, this one may not require you to blot consistently throughout the day. The foundation comes in a wide range of shades so make sure to pick one that’s just right for your skin. There are shades that tend to lean more on the peachy to reddish tone and can look awkward on the skin. CoverGirl Clean Oil Control Liquid Makeup is free from oil and fragrance. It’s dermatologist tested to be safe on oily and acne prone skin. It can control oil and shine without overdrying your skin. In fact, its formulation has oil-absorbers for oil control and skin conditioners to maintain your skin’s moisture. The packaging looks nice at first glance, but it can actually give you a bit of a hard time in getting the product out. You may have to shake it a couple of times, especially when you have little amount of foundation left inside. The consistency of the foundation is thick but it’s highly blendable. You can only build it to a medium coverage which means that you’ll need a separate concealer to cover heavy skin imperfections. Make Up Forever HD Invisible Cover Foundation offers light to medium coverage. It’s packaged in a plastic bottle with a pump for dispensing. One layer of the foundation can help cover your skin’s redness as well as minor skin imperfections. If you have more skin issues, you may have to add one more layer. The finish you can get from this concealer looks much similar to natural skin but better. It doesn’t intensify your skin’s oiliness but it also isn’t entirely flat matte. In fact, it catches light to make your complexion more glowing and radiant. NARS Sheer Matte Foundation can control shine and oil while clarifying your skin. I personally like how it brightens up the skin without accentuating your skin type. A lot of foundations can control oil but they mostly leave a flat finish. Some of them can even make the skin look cakey. This one, however, does a good job at what a foundation for oily skin should do. You’ll love that it also has a non comedogenic formulation so you won’t have to worry about the product breaking your skin out. My concern with this product is its packaging. You’ll have to pour the product out which I think is a bit impractical, especially when you’re in a rush in the morning. The consistency is a bit thick but it’s not the type that’ll cling to your pores. It’s easy to buff out whether you use your hands or a makeup brush. For oily skin, it’s not enough that you know which products are good for your skin type; you also need to know the best ways to apply them to ensure you get their full benefits. If you’ve experienced feeling greasy even after just a few minutes or hours of applying your supposed-to-be matte makeup, then you’ll understand where I’m coming from. Trust me, I’ve been there. Basically, you need to start with a good base. Prep your skin to balance out the oiliness. One good trick is to use a toner. You can also use a facial mist, granted that it contains the right ingredients. Once you’ve prepped your skin, it’s a good idea to apply a mattifying primer. This product doesn’t only help make your cosmetics last longer but it can also even out your skin. This can make it easier for you to apply your makeup on. Apply your foundation as usual and set it with a powder. Let it sit for a couple of minutes on your skin before blending everything out (a.k.a blending). When touchups are needed, refrain from applying powder right away as it can only make your skin look cakey and flaky. Instead, grab your blotting sheets and pat the oily part. This should be enough to keep you oil-free for another few hours. Finding the right foundation type is already a lot of hard work. Choosing the best foundation for oily skin, on the other hand, is a different and more difficult story. To help you understand the different foundation types and how you can make them work with oily skin, here are some of the things you need to know. This type of foundation offers the best coverage and effects for oily skin. Since it doesn’t contain reflectors and shimmers, you won’t be highlighting your skin’s issue when wearing it. Ideally, the best matte foundation for oily skin should absorb oil and provide your skin with beneficial ingredients. Liquid foundation can also be good for oily skin provided that it contains oil absorbing ingredients. It should also be light and can be blended without looking patchy or flaky. This is the best type of foundation to wear on a daily basis since it has the most natural finish. A cream foundation has a wide range of coverage. For oily skin, however, you should stick with one that doesn’t look too heavy or unnatural on the skin. It should blend easily into the skin and be able to absorb excess shine and oil. Be careful when using a cream foundation as it can make or break your look. Applying powder foundation on oily skin can be tricky. If done incorrectly, it can appear streaky and patchy. As a guide, the right powder foundation for oily skin should look as natural as possible. It should be easily applied no matter what tool you are using. Makeup should boost your confidence and not the other way around. However, if you pick the wrong product, there’s a good chance it can make you feel more conscious about yourself. In this roundup, we’re highly recommending Estee Lauder Double Wear Stay-in-Place as our best foundation for oily skin. It has a long lasting formula that can withstand humidity and heat.